Corsair 8GB (2x 4GB) 1333mhz P.. Product weight is 0.02 lbs. Ultra Stable Laptop Memory from Corsair - the Leader in Performance Memory Solutions Designed for current generation notebooks, mini-PCs and netbooks Microsoft® Windows® Vista and Windows® 7 operating systems 8GB (2 X 4GB) DDR3 Laptop Memory Kit - 1333MHz Unbuffered CL 9 SODIMM Memory 9-9-9-24 1.5V Lifetime Warranty Corsair 8GB (2x 4GB) 1333mhz PC3-10666 204-pin DDR3 SODIMM Laptop Memory Kit CMSO8GX3M2A1333C9 Corsair Memory Kits: compatibility and support you can count on If you’re building or upgrading a desktop or notebook PC for general home or office use, Corsair Memory offers memory kits with guaranteed compatibility and the assurance of a limited lifetime warranty. Key Features 8GB (2X4GB) DDR3 SODIMM Memory Modules, 1333MHz Guaranteed to work on Intel and AMD platforms World famous Corsair reliability and performance Designed for use with all SODIMM compatible DDR3 systems DDR3 SODIMM modules have a notch 2.5cm from the edgeView larger DDR3 SODIMM: is it right for you? This kit contains 204-pin DDR3 SODIMM memory modules. SODIMM motules are typically used on notebook and laptop PCs. DDR3 SODIMM modules have a notch 2.5cm from the edge. 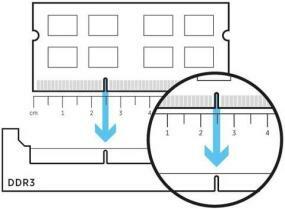 Check the position of the notch in the diagram with the notch in your system's memory slot to be sure. If you have a desktop PC, your system might use DIMM memory, instead of SODIMM. If it doesn't match, your system might require DDR2 or DDR1 SODIMM memory, or DIMM memory. 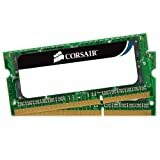 Corsair makes memory in all popular formats, so check your computer's documentation or contact us for the memory type that you need. Limited lifetime warranty, support and service Corsair has been making high-performance PC memory for just about as long as high-performance PC memory has existed. Our dedication to reliability, compatibility and value extends to every product we offer, and countless customers worldwide rely on Corsair. Our reputation is important to us, and that’s why all Corsair DRAM products are backed by a limited lifetime warranty. If you ever need help, we’re available by phone, email, and web forum.